How did you think the metal cut? And which gravers did you use? Hi Daniel, The metal cut wonderful. Im pretty sure it was 416 stainless. I pretty much use a 90 square and various widths of flat gravers. The scroll combination with the four flowers is lovely...... my opinion.The dark background makes it even better !! Thanks for posting the pictures. very cool idea, I'll have to try it. Did you use the regular spacer for the templates? And that with a m42 of carbalt graver. In other words, what graver and what heel. Somehow I don't like the 1.26# spacer for any work but work with a 0.88# spacer all the time. But for stainless I use the carbalt with a 0.725# spacer, Hardly breaking tips there. Hope to get to engraving my two tiny spiderco's soon. I made a few nice designs on my holidays last week. Lots of work to do though. Hi Daniel, I normally just use regular high speed steel gravers. My face is 50 0r 55 degrees with a 15 degree heel and 90 degree angle. I have a hamler fixture that i use alot. When you say spacer do you mean the one that comes with Steves templates? I have and use some templates but i only have one spacer .I didnt even know he made other ones. So yes it must be the regular one.I like steves geometry with my wider than 90 degree gravers. That little spiderco was a little harder than there bigger knives if i remember write. I hope i answered your question? Check out this thread - it tells how to cut pieces of soda straw to get the different lengths and what they do to the angles. Thank you Steve and Stacey. Nice engraving, Douglas. I like the line engraving and sculpted elements intermingled. Can you tell how you blackened the engraving? Gotta agree with all the previous posters. Beautiful job. Very clean lines, you filled the space wonderfully while maintaining a nice balance of negative space. Also, the combination of 3D sculpted flowers and flat scroll work is a very nice concept. Congrats on a gorgeous piece. I noticed this thread started back in 2010, but it is just as relevant now as it was then. 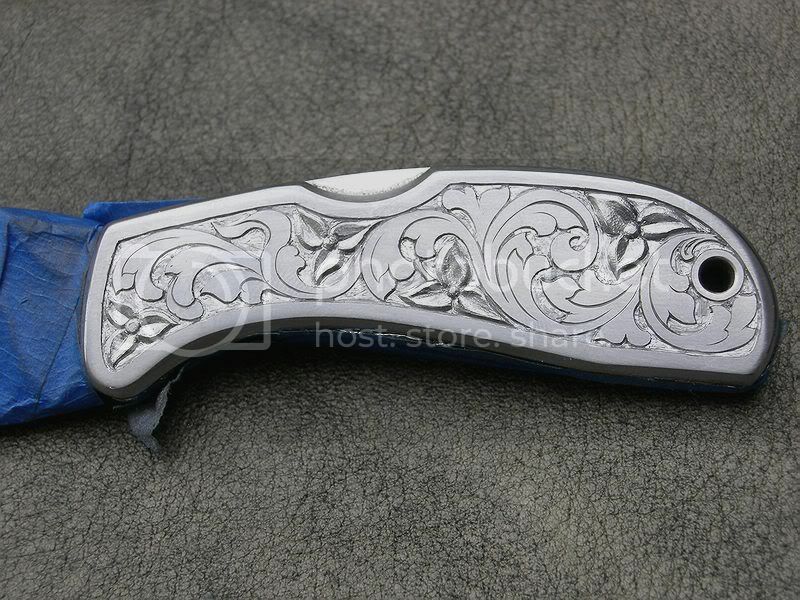 The engraving is fabulous; it dressed up the knife and it increased its value immensely. Thanks for posting this Wayback then.